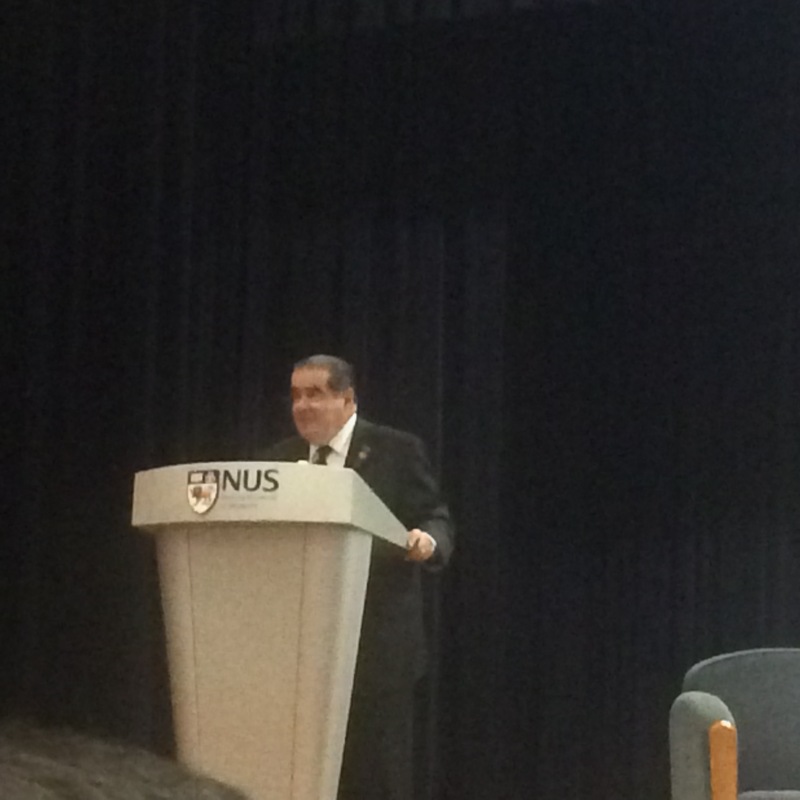 On Tuesday Jan 28., two and a half weeks before his eventual death, Antonin Scalia, then Associate Justice of the Supreme Court of the United States, visited the National University of Singapore’s Faculty of Law to give a talk on legal interpretation. In this piece, three Yale-NUS College attendees of the talk reflect on Justice Scalia and his legacy. Justice Scalia espoused opinions that reignited debates central to the function and fate of American law. Following his death, a flood of commentators rushed to predict his eventual legacy. Some, indeed, have questioned whether he will have one. But while the specifics of Scalia’s influence remain fraught with uncertainty, there is no doubt that he has left an indelible impact on the law. His opinions and his person will be remembered—sometimes fondly, sometimes harshly, but always vividly. I wish to sketch out, in brief, some of those opinions. It is easy to misunderstand Scalia’s position. For American news networks, Scalia is a “conservative” Justice or an “originalist.” These labels, ripped from other contexts, can mislead. And part of the blame may lie with Scalia; legal commentators have been quick to point out instances where his judicial decisions diverge from his avowed beliefs. Nonetheless, Scalia has been clear, in interviews and in writing, about his avowed principles. For Justice Scalia, the interpretation of the US Constitution turns on the original meaning of the text. Unlike other “originalists”, Scalia cared little about what the Founding Fathers may have intended. What matters is what was actually passed into law, or the text of the statute. And in interpreting that statute, he looked to its original meaning, which is determined by how a normal English speaker of that time would read the statute. This is why Scalia’s opinions sometimes included references to dictionaries or other publications from earlier centuries. These documents are a crucial source of insight into what words would’ve meant in those times. Whether you agree or not with this view (see A Matter of Interpretation for good arguments for and against), there is no doubt that it has a certain intuitive appeal. That laws, once made, mean something, and that judges are not free to change that meaning. But Scalia certainly wasn’t the first to endorse this legal philosophy. Rather, Scalia’s greatest contribution was to defend this view vigorously, in both theory and practice, showing how originalism could lead to novel, persuasive, and important legal conclusions. To give just one important consequence of Scalia’s work, legal scholars have largely stopped sifting through Congressional records to uncover some ephemeral “legislative intent.” We recognize, now, that what matters is the text of the law, and not some politicians’ personal interpretations. Throughout his life, Justice Scalia was bombastic, sharp, and sometimes biting. Critics called him acrid; fans hailed him as a hero. It is consequently unsurprising to hear of the controversy surrounding his death. But there is no doubt that for anyone invested in questions of law and legal theory, he was an important voice from the bench. His dissents were stinging; his opinions shaped the legal landscape. His death will be remembered. I attended the talk to understand how “legal interpretation” in the US could be contextualized in Singapore. Having seen multiple instances where the perspective on legal interpretation of the Singaporean government was similar to Scalia’s, I also wanted to see how I could draw parallel between the legal and social challenges faced in the US and those faced in Singapore. Despite my huge disagreements with his “originalism”, Scalia managed to make me see the role of the judiciary and law in a different light. In the talk, no longer were issues simply categorized as “right” or “left and “liberal” or “conservative”; they for a moment became both personal and multifaceted. From gun control to death penalty and gay marriage, Scalia delivered sound, unanticipated arguments (albeit controversial and provoking) at least for a person coming from an outsider perspective (non-US citizen). His death has truly affected my experience in retrospect. First of all, I regret how politicized it is at the moment, with discussion on the appointment of the next justice overshadowing his past role. Second of all, and most importantly, it has made me realize how central the US is to my own academic experience and my social experience at Yale-NUS—and I believe it is not always a good thing. Not only did I fail to draw any link between his arguments and Singapore, I also question why I wanted to draw any link between the US and Singapore at all. It’s as if I put the US justice system as the ideal for justice systems everywhere. The discussion I have had since his talk (and increasingly since his death) also reminds me of the emotional and intellectual gravity that just the idea of the US supreme court has on a lot of students at Yale-NUS. While I still remember my American friends enthusiastically walking me through tens of US supreme court cases during our orientation trip, nobody—including me—has really been interested in the Singapore Supreme Court, or any other legal systems in Southeast Asia. Similarly, a number of electives I have taken are primarily focused on case-studies, issues, and examples from the US. Understandably, information from the US and opportunities such as this talk are more accessible. But if being at Yale-NUS means having more understanding of Asia, perhaps we can start by paying more attention to the region in which we are located. In fact, Scalia was impactful, even as a dissenting voice, not merely because he had more intellectual superiority or legal qualifications, but because of how well he knew the history and context of both the constitution and the United States as a society. Seeing Scalia was my first experience being starstruck. Not that I fainted or anything, but it was the first time I could recall counting the number of feet someone was from me so I could refer to the number later. I had watched interviews of him, read his opinions with laughing, frustrated eyes, and even featured him in a song I made from the audio of a Supreme Court hearing. He was a force, I knew, and it wasn’t often a force stepped seven feet from me. Seeing a force came with its surprises, though. Scalia was much older than his opinions showed. He walked with a shuffle, and his face seemed to droop even more than in the flat PBS videos. He also surprised me by being exactly how I thought he’d be. Unapologetically, he sent snarky replies to nearly every question, even those from the head of the law program. When he was asked why he wrote dissenting opinions at all, he said he knew it was a lost cause, but that it was just for those law students hungering for reason. When the secondary school student to my left asked about the wage gap between women and men, Scalia did not falter: if you want to fix it, he said, make a law to fix it. You can predict Scalia answers after a while, and I anticipated that one with pity. When I heard Scalia died a little over two weeks later, I didn’t know how to take it. He had looked old, but he still had had ‘fight’; he fended off a twelve-year-old, after all. It didn’t seem possible for someone with that sort of conviction to die. His passing was thus another first of mine: my first time feeling like I was part of history. I had a vague sense that I had witnessed the end of something important, and the start of something else important. It wasn’t well thought out, nor particularly astute, but it colored his death in a way I had never experienced before. I wanted to bring him up with everybody, if only to say that forces don’t die every night. It was an almost instantaneous nostalgia. It has been weeks now. I don’t have any lesson for Yale-NUS about the inevitability of death or the ability to get along with those who disagree with you. Instead, I’ve been thinking about Scalia’s fight. Many times, he knew his opponent was going to win, but he also knew who he was fighting for and that propelled him on. I do think his opinions led to repressive environments. I do think his statements veered too much towards flippancy. But I also think if we students can find just some part of his spirit—can fight with no expectation of support—we’ll be much better for it. Many of us will probably be fighting ‘against’ Scalia, but we’ll be doing what we love in a very similar way. And if we’re lucky, we can do it with family, friends, and fulfillment till we’re 79, too.